At our Washington, D.C. practice, dermaplaning is becoming increasingly popular as a safe, highly effective way to scrape off outer layers of dead skin that cause a dull complexion. During the procedure, one of our aesthetic specialists uses a sterile scalpel to exfoliate the skin. There is no downtime and the treatment is complete in less than 30 minutes. Dermaplaning is recommended for individuals of all skin types, except those with acneic skin — oily skin prone to acne. People with deep, cystic acne should wait until active breakouts are clear before undergoing a dermaplaning treatment. Dermaplaning is a safe exfoliation alternative to chemical peels for pregnant women or mothers who are breastfeeding. After scraping off dead skin cells and the fine, vellus hair (“peach fuzz” or “baby hairs”), the skin is immediately smoother and softer to the touch. Dermaplaning is an excellent treatment whether you want a refreshed appearance before an important social event, or you just want to restore a subtle, youthful‐looking shine to your skin. Another benefit of dermaplaning is that it helps skin care products penetrate deeper into the skin and helps create a flawless canvas for applying makeup. The treatment begins with cleansing and thoroughly drying your skin. Next, the specialist pulls the skin taut, and then holds the scalpel at an angle and uses short strokes to carefully scrape the skin’s outer layer. The procedure doesn’t cause any discomfort and is similar to shaving your legs. 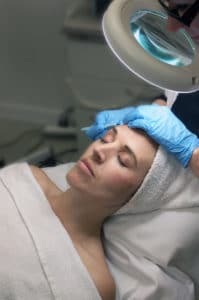 Dermaplaning is often combined with a chemical peel, especially for patients who are beginning a new skin care regimen. It can also help prepare the skin for more invasive procedures, such as laser skin rejuvenation. The cost of dermaplaning averages about $150 to $200, and patients maintain their refreshed appearance with monthly treatments. To learn more about dermaplaning and creating a schedule of regular skin care treatments in Washington, D.C., request a consultation using the online form, or call our office at (202) 785-4187 to schedule an appointment.